Packtpub is having a day against DRM on which you can buy their DRM-free content at $10 for 24 hours only on May 6th – that’s all 2000+ eBooks and Videos at www.packtpub.com. 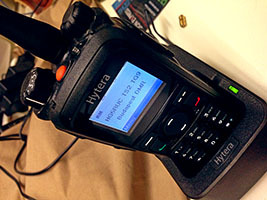 Just a week ago I bought a Hytera PD785G DMR (Digital Mobile Radio) handheld transceiver. Now I’m spending my free time reading about DMR, experimenting with the Hytera CPS software, and writing about DMR to my radio club’s webpage. DMR works way beyond my expectations compared to analog radio. I can communicate on locations where my analog Yaesu VX8G can’t, and the DMR repeater’s antenna is about 100 meters lower than the analog repeater’s. Sending and receiving text messages is very fun, and I like the compressed voice of DMR’s AMBE+2 codec very much. Recently I’ve been working on a Red5 webapp called kdrlivestream which authenticates users using a MySQL database. This will be used for live streaming my radio club’s subscription based remote courses. Red5 has a built-in webapp called live, but it doesn’t use authentication. Everyone will be able to publish and watch streams using your private Red5 server. kdrlivestream always authenticates publishers using usernames and passwords stored in a MySQL database. By default, every viewer has to be authenticated too, but publishers can specify that their streams are public. Public streams can be watched without any authentication. Optionally the webapp can periodically store active publisher and viewer info into the database (who watches and publishes what). See more info on the project’s GitHub page! To open the stream from VLC, set RTP over RTSP (TCP) on the Input/Codecs tab. I’ve got the chance to read another very good quality book from PacktPub. 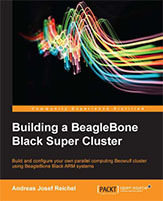 Nice intro to the BeagleBone and cluster computing even for those who are not into Linux and embedded hw & sw. I think they are the target audience. I didn’t know much about open source cluster computing software, know I know the basics, and I’m happy that there are nice and easy solutions for dealing with multiple processes running on multiple machines. I hate making videos with my phone. I need autofocus and wide zoom range, I only have old manual fixed Nikon lenses so recording videos with my Canon DSLR is not an option. I don’t need a large sensor as I want to focus on content, not recording artistic videos with shallow depth of field. I want to record my videos with high bitrates to get rid of compression artifacts. Canon has some consumer camcorders but I didn’t like that you have to open and close the lens cover manually each time you power the camcorder on or off. The Powershot S120 would be a good choice as it’s pretty small and used by a lot of people for video recording, but I found out that it has very noisy sound and no mic input. An even bigger problem is that it can record only about 14 minutes in one take as the maximum file size per clip cannot be larger than 4 gigabytes. Panasonic HC-V770 and Sony PJ620 can be bought at nearly the same price, but the former one won’t be available here in Hungary until spring. Their specs are nearly the same, as Sony added 50mbps recording capability to the PJ620. The biggest difference is that Sony has the Balanced Optical Steadyshot feature. Balanced Optical Steadyshot is the best thing happened to consumer camcorders in these years. From now on, I will only buy camcorders/cameras which have at least the same stabilization capability as Sony camcorders. The built-in USB cable is a great feature. I had to buy a 64GB SDXC card, as it didn’t let me record in 50mbps XAVC-S with a 32GB SDHC card. 50mbps recording is as fast as recording in lower bitrates. It creates .mp4 files which can be edited nicely in Vegas. 50mbps videos have much better quality, I’d recommend that you shouldn’t buy a camcorder which can’t record in 50mbps. The built-in projector is surprisingly bright and it’s resolution is quite good, but I don’t think I will use it more than once a year. Copying files over Wi-Fi are slow if you have big 50mbps .mp4 files, so I don’t use that and airplane mode is always turned on. This might save me battery power as well. I can’t see the display correctly if it’s not pointing nearly exactly at me. It has a narrow viewing angle. It also has a fairly low resolution, so I’m not satisfied with it. It’s touch interface is a resistive one so you have to press it with force, touching it isn’t enough. It’s annoying that the OSD can’t be turned off while recording (I mean the OSD zoom and rec start/stop buttons). Sound quality is good. I didn’t try multichannel recording, I’m ok with two channels. Zooming could be faster but it’s ok anyway. At least it’s sound can’t be heard during recording. Background sound cancellation is a totally useless feature. 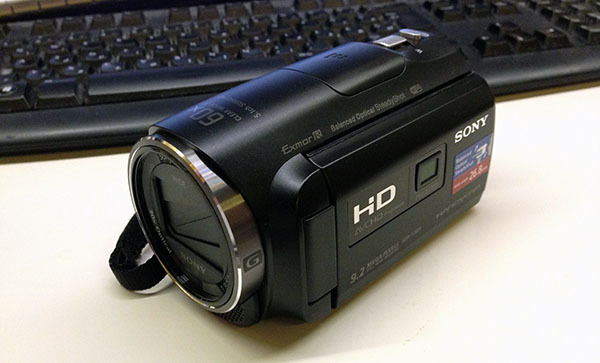 The camcorder is pretty light, it has good build quality. The leather surface at the handling side is comfortable. I hope this post helps others choosing which camcorder to buy. 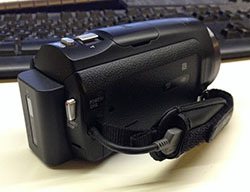 If you are looking for a good consumer camcorder, buy the PJ620. 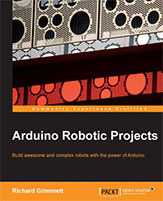 Packtpub sent me this great book called Arduino Robotic Projects. The title should be “Learning Arduino” or something like this because this is the best book I’ve read so far for beginners who want to learn Arduino. The chapters are well-written, everything is clearly explained, images and source code examples are great. The book’s structure is wise and covers everything from choosing an Arduino board to connecting to a Wi-Fi network, using sensors or controlling servos and DC motors. If you want to learn Arduino, don’t hesitate, get this book.